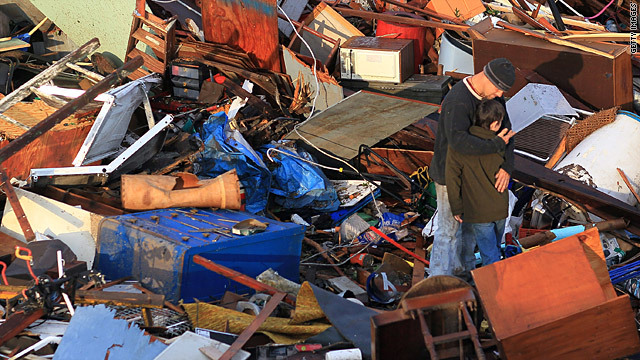 A rescue team searches house to house for survivors Monday after a deadly tornado struck Joplin, Missouri. Piers Morgan has more on the recovery efforts at 9 p.m ET Tuesday. At 10 ET on "AC360º," Anderson Cooper brings firsthand accounts of surviving the powerful tornado. Also, did you experience the tornado? Send your photos, videos or stories. (CNN) -- The devastating tornado that killed 124 people in Missouri this week puts the United States on track for a record-breaking year -- despite improved forecasting, warning systems and public awareness, weather experts say. By 7:20 p.m. Tuesday, the death toll in Joplin had reached 124, making it the single deadliest tornado since the National Weather Service began keeping such records 61 years ago. The tornado in Joplin brought the number of people who have died in U.S. tornadoes to 489 so far this year. The figure could escalate as rescue workers continue digging through rubble from Sunday's tornado in Joplin, Missouri. The deadliest tornado year on record is 1925, which had 794 deaths, according to the National Oceanic and Atmospheric Administration. The number of fatalities so far this year is more than 8 1/2 times the average number for an entire year -- 56, according to CNN meteorologist Chad Myers. With all the advancements in storm technology, the question is simple: Why? "That's the question of 2011," said Bob Henson of the University Corporation for Atmospheric Research. "Why have so many people died in these tornadoes? That's the open question. It's partly because of the strength of these tornadoes. Also because they've hit populated areas." Myers said the brute force of some tornadoes might just be too severe for many structures. "Some tornadoes, you just can't survive them," he said. "They're just too big." Since 1875, the average number of deaths from tornadoes has actually decreased -- from about 200 to 55 a year, Myers said. This year is a sharp anomaly. In addition, the number of killer tornadoes is higher in 2011 -- 51 deadly tornadoes have touched down in the United States this year, compared to an average of 22 killer tornadoes in the past. That's counting two more tornadoes in Missouri Tuesday night. And it's only May. But early statistics on U.S. tornadoes have been spotty. Because twisters were not measured the same way they are now, experts don't know whether the 1925 Tri-State tornado that killed about 695 people in Missouri, Illinois and Indiana was actually a single funnel or many -- which is why it's not officially considered the deadliest single tornado. The weekend tornado in Joplin stirred memories of two fatal twisters that struck in Alabama last month. One tornado hit Hackleburg and Phil Campbell, killing 78 people, and another struck Tuscaloosa and Birmingham, killing 61. While many cities in tornado-prone areas have tornado sirens, the alarms sometimes get ignored. "The sirens always go off, so no one thought anything of it," Joplin resident Alexa Wattelet said. "Where we were, nobody really seemed like they were in much of a shock." But Myers said even if people take all possible precautions, a tornado can still leave fatalities. "If you get hit by something the size of a 225 mph storm, it is not survivable," he said. "And that is not to scare anyone. But the people that did it right are not to blame." CNN's Sean Morris and Greg Botelho contributed to this report. Click through to see the damage from the deadliest U.S. twister since modern record-keeping began. A security camera records damage from a Kansas tornado. CNN affiliate KTKA-TV in Topeka has more. The warnings seem almost ubiquitous today, but the word "tornado" used to be banned in weather forecasts. Joplin High seniors were wrapping up their graduation ceremony as the devastating storm started to roll in to town. Click through to see the number of tornadoes by year since 1950 and how many deaths resulted from these twisters. 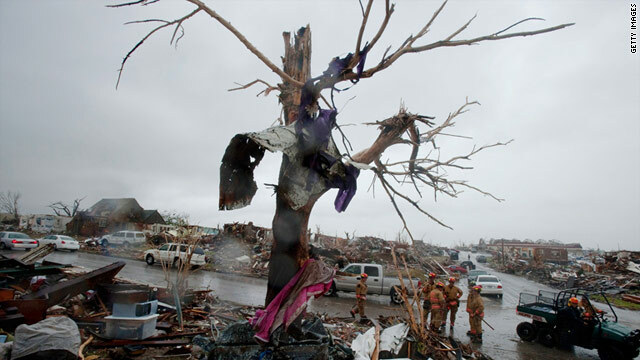 Survivors of the Joplin, Missouri, tornado describe their experiences riding out the deadly twister. Hundreds of firefighters, police officers, medics and more head into Joplin, Missouri, to search for survivors. After surviving the deadly storm, residents in Joplin, Missouri, brace for the possibility of more tornadoes.